A great place to get away from the hustle and bustle of the city, Lake Palestine is a beautiful, natural landmark on the Neches River in Northeast Texas. A freshwater lake set in the heart of East Texas forest trails, Palestine is approximately 120 miles removed from the noise and rush of the Dallas–Fort Worth Metroplex. But the lake is no isolated Walden Pond. Palestine is surrounded by a growing population that now exceeds 6,000—a vibrant community of fishers, boaters, and other recreationalists, many of whom own homes right on the lakefront. With many lake homes for sale, this community is ever ready to welcome people who appreciate the lake's natural beauty and recreational opportunities. 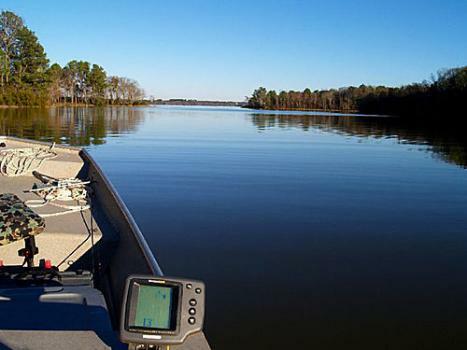 Fishing opportunities are abundant on Lake Palestine. The lake is home to several species of bass, including largemouth, spotted, white, and hybrid striped. Fishers also regularly reel in crappie, catfish, and sunfish. Palestine offers a variety of fishing environments, from the Hydrilla and other vegetation that dominate the north side of the lake to the more open water of the south side. And the lake's community is proud of its excellent fishing. Lake residents are happy to give new neighbors advice on the best fishing spots around the lake. The Lake Palestine Chamber of Commerce holds a regular fishing tournament, giving out a cash prize and free boat launch passes for the biggest catfish, crappie, and black bass caught each quarter. 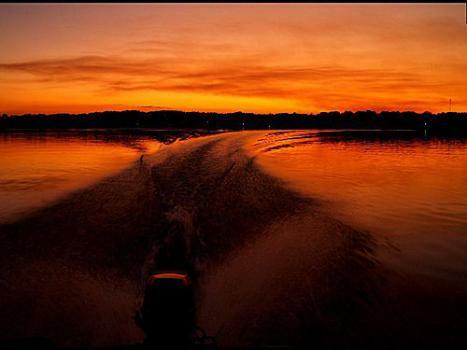 Despite its reputation as a fishing lake, Lake Palestine is also a great destination for boat enthusiasts. With 25,560 acres of surface water, there is plenty of open space for everything from pedal boats to larger recreational boats. While the lake's north side is shallow and covered with lake vegetation and timber, the majority of the water is perfect for using personal watercraft like jet skis and WaveRunners, wakeboarding, and water skiing. Palestine's several bays and coves provide protection from the wind, and boats can access the lake through five public boat launches or more than a dozen private marinas and ramps. Lake residents do more than fish and boat at Palestine. Two different golf courses border to western edge of the lake: Eagle's Bluff, which looks out over Fish Bay, and Emerald Bay, which rests on the north shore of Saline Bay. Both are fully equipped 18-hole courses that challenge all levels of ability. Both are part of residential communities and owned by community members. For more information on joining one of these lovely communities, go to GolfHomes.com. The lake's 35 miles of shoreline and surrounding area also prove ample opportunities for bird watching, camping, hunting, and swimming. And after watching a beautiful sunset over the water, lake home owners can head to Tyler, Texas, about 15 miles to the northeast, for its restaurants, bars, and churches. Far away from Texas's crowded urban centers, Lake Palestine is a picturesque setting and a great place for fishing and water sports. Those looking to take advantage of one of the many lake properties for sale on Palestine’s shore can look forward to a welcome from a friendly community of neighbors who appreciate the lake's natural and recreational features. Gorgeous 25,600 Acre Lake used for recreation, water conservation and wildlife preservation. 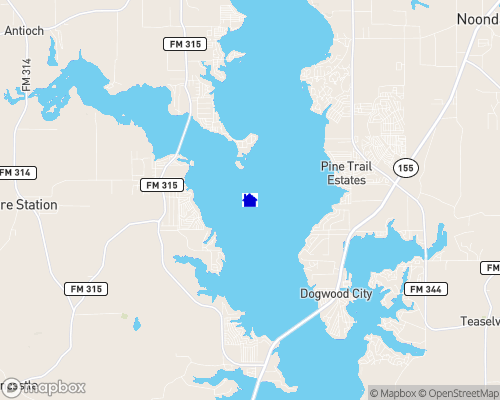 Lake Palestine is on the Neches River four miles east of Frankston, in northeastern Anderson, southeastern Henderson, southwestern Smith, and northwestern Cherokee counties. 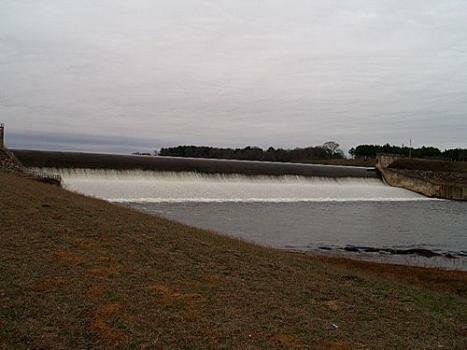 The dam is owned and operated by the Upper Neches River Authority for industrial, municipal, and recreational purposes. Construction of the original dam was started in 1960 and was completed on June 13, 1962. Lake Palestine is formed by an earthfill dam some 5,720 feet long and is used for water conservation, recreation, and wildlife preservation. The crest of the spillway is 345 feet above mean sea level, and the surface area is 25,560 acres. This long, narrow scenic lake is 26,0000 acres, located in the piney woods of East Texas, and is flanked by native pines and hardwoods. Shoreline development for homes and businesses is extensive. The water is fairly clear and somewhat fertile, with a maximum depth of 58 feet. One of the most popular lakes for the months of February and through spring, Palestine attracts bass clubs and team events on a regular basis. Largemouth bass, native, Florida Largemouth bass, Hybrid Striped bass, Channel catfish, Blue catfish, Walleye, White crappie, Black crappie, and a variety of smaller Sunfishes, Gizzard Shad, Threadfin Shad, and other forage fish. Traditionally this lake receives heavy fishing pressure, including numerous bass tournaments. But the lake has maintained quality recreation, due to natural productivity and catch-and-release. Fishing Tips: For bass, use diving crankbaits or plastic worms along the flooded creek channels. For channel catfish, use chicken livers, frozen shrimp or earthworms, especially in the late spring when the fish spawn in rocky shoreline areas. Public access is limited. There are no public parks. There are currently 6 public boat ramps. Private camp grounds and launch ramps are available. Most charge a modest daily fee. Purtis Creek State Park - Activities include camping, picnicking, fishing, boating, and hiking. The park rents paddle boats and canoes. The facilities available are campsites with water and electricity; primitive campsites (minimum mile hike-in); an overflow camping area; lighted fishing piers; fish-cleaning shelters; rearing/trout ponds; boat ramps; courtesy docks; picnic sites; and a playground. Tyler State Park - Activities include picnicking; camping; boating (motors allowed - 5 mph speed limit); boat rentals; fishing; birding; hiking; mountain biking; lake swimming (in unsupervised swimming area); and nature study. Facilities include restrooms with and without showers; picnic sites; 2 group picnic areas without shelters; 1 group picnic pavilion; campsites with water; campsites with water and electricity (pull-through and back-in); campsites with water, electricity, and sewer (pull-through); screened shelters; and a group camp with 6 screened shelters for overnight use and a dining hall with a full kitchen for day-use only; shelters and dining hall can be rented together or separately. Other facilities include a trailer rally area (30 water and electric sites with a group picnic pavilion); trailer dump stations; a group dining hall; a 2.5-mile hiking trail; an 13-mile mountain bike trail; a .75-mile nature trail; an amphitheater on the lake shore; a seasonal grocery store that sells souvenirs and fishing supplies and rents canoes, paddle boats, kayaks, and fishing boats; a laundry tub; and a concrete launching ramp with a courtesy dock. Premium sites are available. Rusk/Palestine State Park - Activities include camping, picnicking, fishing, and nature study. Added attractions include tennis courts and a playground, in addition to the Texas State Railroad train rides in restored passenger cars. Facilities include restrooms with showers; picnic sites; campsites with water and electricity; campsites with water, electricity, and sewer; an open-air, gazebo-style pavilion with a fireplace, and a dining area; a screened group dining hall complete with a kitchen; playgrounds; a fishing pier; a trailer dump station; old Rusk depot building; tennis courts; a 15-acre lake; and a .25-mile nature trail. Tyler Municipal Rose Garden, famous as "Rose Capital of World"
Only 20 to 30 minutes away is Gladewater, "The Antique Capital of East Texas."